Have you ever thought about changing the seats of your chairs according to climate variations? “What an absurd idea!” you might think. In case you want to know more about this and many other amazing ideas, you definitely should take your chance and leave for what I called a “one-day cruise” at the Victoria & Albert Museum, London, UK. Entering the exhibition “Ocean Liners: Speed and Style” feels a bit like embarking an ocean liner. Colourful ribbons above you simulate the very moment of farewell, when they soon will no longer connect the parting travellers on board with the beloved persons staying behind on the pier. We even hear the deep and pervading sound of the ship tyfon. While passing a faux gangway we see short historical film sequences dating back to various decades of the 20th century, whitness people streaming aboard and other scenes. The start of an exciting adventure, often both in terms of an exceptional journey and in terms of heading for a new future life on another continent. But before enjoying life aboard let us have a brief look at what happened before embarking. From the 1850´s until 1914 the transatlantic shipping lines relied on the hugely profitable migrant trade, whereas first- and tourist-class passengers travelling for business and leisure was the focus from the 1920´s onwards. As in every business, advertising was very important. Impressive posters, like the ones presented to us in the first room of this exhibition, called our attention. Travelling by ship for business and leisure was new and made appealing for a wealthier clientele. “…[T]ravel by liner was transformed in the public imagination from a dirty, dangerous and sickening experience into a glamorous and aspirational activity” is explained. Booklets presenting life on board in pictures were available like the Cunard´s “The new Art of going Abroad” from 1929. A very stylish, pleasant and at the same time safe and straightforward journey was promised, made possible by the newest technological achievements. To get an idea of the possibilities these ocean liners had to offer, we were presented with an attractive big model of the ship we could travel with. Also, the shipping lines had made a trustworthy impression on us with their offices located in central Cockspur Street in London. The changing motifs and interests of both sides, shipping lines and passengers, become clear for us with the exhibited material here. Equipped with this historical background knowledge about the cruise industry we now enter the world on board of “our ocean liner” and we are received by impressive examples of historical styles that represent the late 19th and early 20th century of luxurious travel on ocean liners for first-class passengers. Beside elegant furniture and wall decoration, design plans and drawings give an insight into the world on board. As international competence between shipping lines for passengers grew, the aim, naturally, was to offer an ambience with outstanding designs, best service and promising possibilities on board which would cause wonderful and memorable experiences throughout the journey. Leading artists and craftsmen in their fields were responsible for the design. Completely new types of decorative materials that were suitable for on-board use were developed. The Tynecastle Canvas 1875-1900, produced by the Tynecastle Company in Edinburgh for example, was an embossed wall-covering, lightweight and able to flex with the movement of the ship. The ocean liners were also seen as representing their nations thus reflecting intensified national rivalries and carrying political meaning. In fact the ”immense construction costs [of the ocean liners] were frequently supported by government subsidies”. The exhibition would not be in the V&A if the museum hadn’t an amazing range of design examples and pieces to offer to us. We “cruise” through different time periods in ocean liner history: Art Deco from 1919 to 1938, a more contemporary style that combined internationalism with national characteristics and traditions from 1939 to 1945, and afterwards post-war liner design seeking “to represent the modern nation in an increasingly cosmopolitan age”. Though sometimes I lost track a bit, we get to know outstanding pieces many of us probably never heard of. Definitely we have never seen these before in the same combination as it is the “first exhibition to explore the design of international liners and their cultural impact” according to the V&A. To name just two: The Cathey Lounge, designed by Edmund Dulac on The Empress of Britain (Canadian Pacific) is one of the most spectacular examples for the fashionable Chinese style during the 1920´s and 1930´s with its ornamental fretwork, gold ceiling, columns faced with black glass, and lacquered vermillion and ebony furniture. Another example is the first-class Beauvais Suite on the Ile-De-France which was the most luxurious ship on the transatlantic route, described “as a museum of modern French decorative arts”. The Suite was decorated with brightly-coloured floral marquetry panels typical of 1920s Art Deco. Different to the exhibition example, a glass light fitting designed by Lalique would have been mounted in the centre. Critical aspects are not hushed up during the discovery tour through the exhibition rooms, though not playing a prominent role. Remembering the title and focus of the exhibition this is logical. One of the somehow critical aspects mentioned is the use of exotic woods and their origin. “The ship´s interiors became a showcase for woods from British Colonies” is mentioned in the introduction to the Queen Mary of the Cunard Line. As an example we have an A. Dunn & Son panel employing 35 different woods; a refelction of the impressive difference between the (at least) two worlds on board, the one of the passengers and the one of the crew including officers, waiters, bellboys and the engine-room workers amongst others. Few words and pictures later on in the exhibition document these. An exception to critical aspects not playing a prominent role in the exhibition is the “speed” aspect of the exhibition title. After having strolled through stylish furniture, wallpaper, carpets, tiles and the like we walk through a small black and empty space. After that we enter a noisy room with machine sounds. We heard from a distance, in the room before, and were already wondering what was expecting us. The floor feels and looks different. It is not a wooden floor anymore but a metallic flooring with relief design, intended to prevent slipping, as we know from industrial production. Detailed technical information about several ships, for example the famous Great Eastern, waits for us here. Also a colour lithograph from about 1861 demonstrates the situation on board of the Great Eastern when the rudder pin broke during its third voyage and “strong winds violently rocked the ship for several days”. The big oil painting from Stanley Spencer from 1941 focuses on men working in a shipyard. Among them men who are bending forward and pulling heavy metal parts needed for the ship construction with ropes strained on their backs, reminding us of pictures with men working hard to build the Egyptian pyramids. Keeping the above in mind we continue our journey. What a feeling when, with only a few steps, we suddenly reach a completely different scenery with a swimming pool, a view on the ocean and wide horizon and, not to forget, a sky filled with stars. At this point starts the part we are looking forward to when we plan a cruise. Life on board with luxury, leisure, pleasure and … fashion. 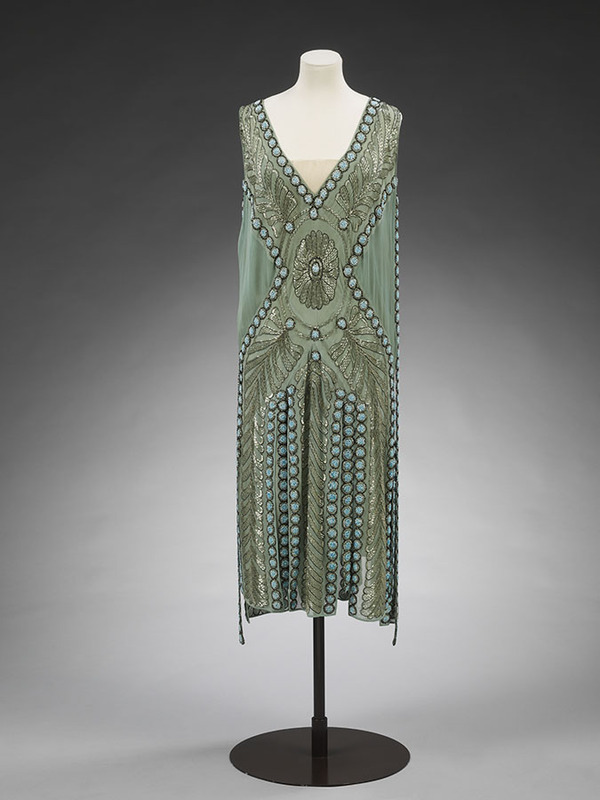 The evening wear of Miss Emilie Grigsby, a frequent traveler in the 1910s and 1920s, is set in scene on a huge staircase, simulating the so called grande descente, the key event of the day that took place every evening in the first class. Making their way down a big staircase to the dining room the ladies presented the latest fashion to the audience. Miss Grigsby (1876-1964), a New York socialite, was showcasing the greatest couturiers like Jeanne Lanvin (‘Salambo’ Dress), Madeleine Vionnet and Paul Poiret, wearing his revolutionary uncorseted dresses and his silk satin orientalist design ‘harem’ trousers. Also fashions in swim wear were relevant on board, amongst the exhibited pieces a knitted woolen (!) bathing suit from 1925. Apart from fashion and travel accessories we have fun watching a film about activity attractions on board, one of them being camel- and horse-riding machines. We are surprised that bellboys walked the passenger´s dogs and about the printed menu for dogs on the Normandie around 1935. Menus and posters leave no doubt about the quality and quantities of food consumed during the journey. And for those of us who like David Hockney and his work a surprise is waiting when it comes to rooms for young people on board. Maybe his name and his painting “A bigger splash” was in our mind already before reaching this “young people section”, namely when we heard the splash of someone jumping into the swimming pool for the first time when admiring the swim wear in this room. Again, as in the other rooms before, our senses are touched with sounds accompanying close to reality sceneries like the swimming pool and the central staircase, not to forget the films and pictures and of course the exhibited objects. Together they might even provoke the smell of ocean air or the feeling of water while jumping into a pool. As if we would need something that takes us out of our romantic dream world at this point, we are now confronted with the sinking of the “Titanic” in form of a wooden panel fragment from a door in the first-class lounge from about 1911. At the end of our very informative, sometimes breathtaking and generally inspiring and pleasant “one-day cruise” there might be several of us who do not feel like leaving the shelter and luxury we found on board the last hours. Especially as we know what is expecting us outside: Sure enough no such density of wonderful design, no ship tyfons nor a wide ocean horizon or a dark blue southern sky filled with stars. On the other hand we know there is much more to be discovered in the future once we leave this “ocean-liner”. The exhibition makers provoked our emotions with their work – a feeling of wanting to stay on one hand and a feeling of wanting to leave at the same time, emotions probably quite similar to those who have experienced a journey with an ocean liner in real life, be it decades ago or nowadays. The good thing is that we can come back for another “one-day cruise” to the V&A as often as we like until Sunday the 17th of June 2018. If you want to read about clothes for travelling, fashion designers “cruise collections” included, you are invited to read the article “Travelling Clothes” written by Birgitta Huse in the latest volume of The Protagonist Magazine, London, Vol. 4 (for stockists see www.theprotagonistmagazine.com or order with www.boutiquemags.com or www.somersethouseshop.com). Lastly, coming back to our question about seating according to different climate from the beginning of this article this little secret is amongst the many to be discovered in the exhibition and shall be disclosed now. To change the seating of your chairs according to climate variations would not be a completely new idea. In the second room of the exhibition we can admire a chair which combines practical aspects of comfort in a perfect way with luxurious design as the round middle part of the seating was changed depending on the climate expected on the journey with the ocean liner.